How many times have you made reservations at a restaurant only to find the decor disappointing? Maybe you figured a place called "Haute Meal" would feature modern fare and furniture, and instead you find a dark dining room decked out with stained glass, worn red leather booths and pink lighting intended to erase wrinkles and enhance the appearance of the meat course. Face it. If your patrons have to press their faces against the window to see what your business looks like on the inside, they're at a disadvantage -- and so are you. That's why Google is now offering to take interior photographs of your restaurant, hotel, retail shop, gymnasium, coffee house or other storefront business and share them with potential customers who are researching your business using Google search and Google Places. Google-employed photographers shoot these photos using fisheye and wide-angle lenses, and beginning this week, they'll be snapping immersive 360-degree panoramic views of interiors that can be placed on your business' Places page. Consumers will then be able to access those views directly from Google Maps via the Street View option. Currently, business owners can upload still photos to their Places page, as can consumers. But panoramic views that allow the Street View to delve inside your establishment are only available if Google shoots the photos and stitches them together for you. Of course, the best news about all this is that if you apply to participate and your business is chosen, the service is absolutely free. Note, however, that it's currently only available in five U.S. markets: San Antonio, Orange County, Calif., Phoenix, Bay Area, Calif., and St. Petersburg, Fla. Google has already conducted thousands of these photo shoots since it first announced the program over one year ago. So, how do you go about getting Google to set up a photo session at your place of business? Just fill out Google's Business Photo Shoots application. 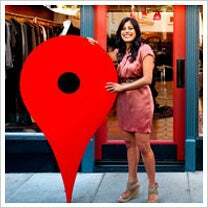 If your business is selected, Google will call you to confirm a date and time to visit your location for a photo shoot. It's those locations where the greatest numbers of requests emerge that helps Google determine where to send its photographers next. So if you miss the first go-around, Google keeps your request on file for future opportunities. Either way, that shouldn't discourage you from uploading your own photos to your Places Page by logging into Google Places. By the way, you should know that Google's not the only outfit mapping the inside world. EveryScape, for instance, works with Bing -- the world's second-leading search engine -- powering the "Step Inside" area of Bing's local search results. In addition, RealPlaces and Point Inside are also mapping interior spaces. Would you welcome Google photographers inside your establishment? Let us know why in the comments section.